The Binding of Isaac: Rebirth is an action-packed RPG shooter set in a series of randomly generated dungeons. It uses a few rogue-like elements, as an adventure game driven by grotesque monsters and sad snippets of Isaac’s miserable existence. 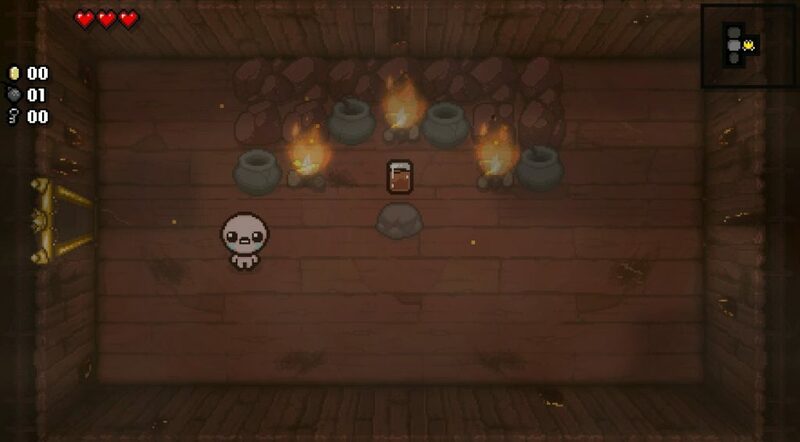 Help the pitiful boy Isaac escape the deadly labyrinth that is his basement. Brought to you by the creators of Super Meat Boy, The Binding of Isaac depicts the extent of a child’s imagination through hideous creatures that represent Biblical figures. Rebirth is the name of its remake, featuring a brand new soundtrack, hand-drawn pixelated sprites, 100 unique seed generators, and enhanced special effects. This translates into 450 items or power-ups, 18 endings, more than 20 hard-mode gauntlets, 276 hidden secrets, God knows how many unlockables, spanning well over 500 hours of gameplay. To fully appreciate what this game has to offer, you’d be stuck there forever grinding out those 300+ achievements. But that’s entirely optional. Besides bragging rights, you won’t get much out of it. The game’s strong point has to be the ugly bosses and their ability to hurl their body parts at Isaac. The rooms are covered in mounds of turds which you’ll see soon enough. That’s right, bloody explosions and poop physics are everywhere! In the intro, Isaac and his mom lived together watching Christian broadcasts. His mom starts hearing voices from above, presumably from God. She heeds the commands in order to save Isaac who has been corrupted by the evils of the outside world. Yes, she is probably insane at this point. Isaac’s mom confiscates his toys and locks him in his room naked. She tries to kill Isaac with a butcher knife but fails when he jumps down the basement hatch. He wakes up terrified in one of the bottom floors which is inhabited by swarms of deadly monsters. 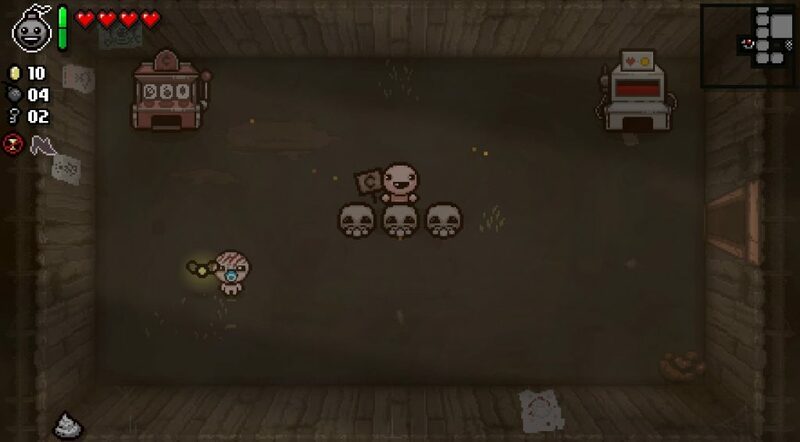 The controls aren’t hard to master: Use WASD to move Isaac. The arrow keys are for shooting tears at enemies. Pressing E drops a bomb to blow up rock formations. To activate power-ups (they don’t tell you how), you have to use either Q for pills or the Spacebar if the item is battery-powered. The dungeon floors are in fact, randomly generated because seed codes determine the layout of each room in the dungeon. This means no two runs are the same. The monster spawns and rare power-ups change every time you start a new game. You’ll have to fend off hordes of disturbing creatures in order to stay alive. The rooms are organized into chapters. In later levels, Isaac is forced to fight stronger enemies, despite the lack of access to stronger gear at times. 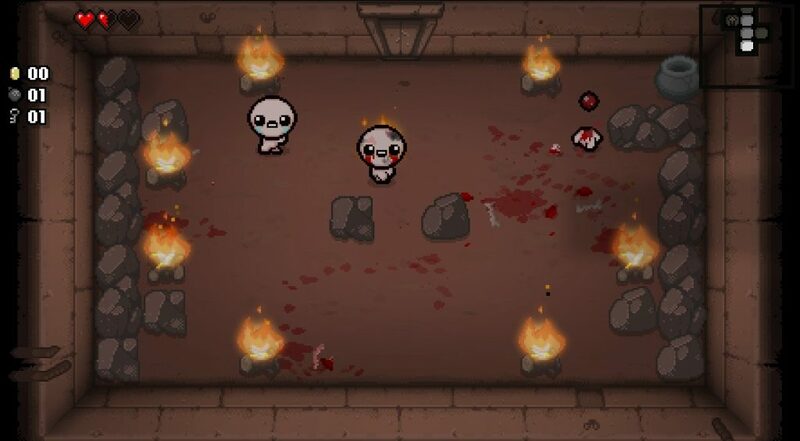 The burning basement and flooded caves are exclusive to DLC packs like in Afterbirth. Normal rooms drop pickups once all the monsters have been defeated. Isaac can pick up beating hearts, bombs, batteries, or gold coins that are well hidden inside rock piles, campfires, and turd mounds. To put out fires/break apart turd, simply shoot tears at them. Rock piles are destroyed using bombs. Save your bombs for dire situations since they are hard to find. 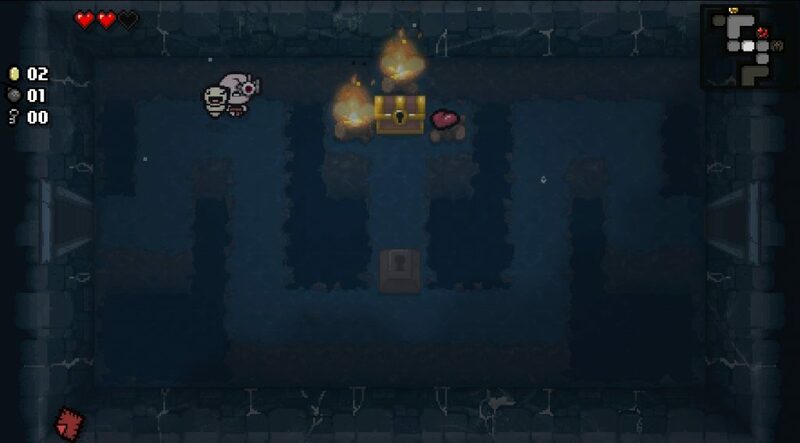 The number of coins, bombs, and keys you have on hand is displayed to your left. The map shows you how many rooms are nearby. Just like Link, Isaac has three hearts. 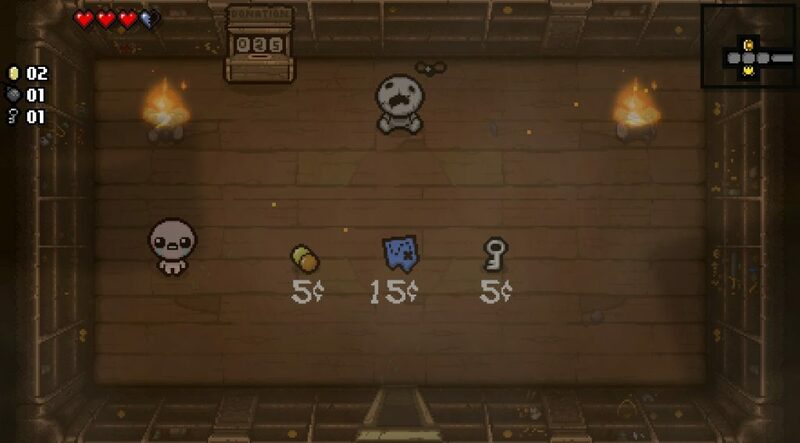 The silver ones are added to Isaac’s health counter. When Isaac is hurt, he will lose them permanently unlike regular hearts. Once you run out of hearts, the game ends. You’ll be reading Isaac’s will, entrusting all the “stuff” to his cat, Guppy. 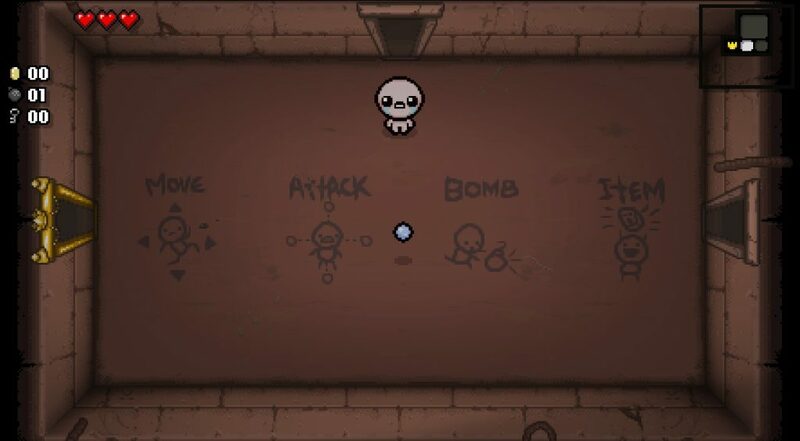 To survive longer, you must collect power-ups that boost Isaac’s health, speed, tear damage, or fire rate. Pills produce side effects on Isaac such as puberty. Tarot cards can even teleport Isaac to a secret area. There are hundreds of items/trinkets to collect! These floors require players to have top-notch reflexes. The monsters have their own attack patterns, some fire blood shots while others deal touch damage to Isaac. Spiders and zombies will pursue you in close range. Maggots may charge at you upon sight. Roundworms emerge from the ground to shoot more blood. Monsters have stages of protection; they don’t always die when hit by Isaac’s tears. Gapers can break off body parts that continue to shoot projectiles. Fatties will fart to knock back Isaac. Attack flies follow Isaac and deal contact damage. Dips are small turds that dash around. Mulligans avoid Isaac but spawn flies after death. The enemies are classified by their attack patterns. 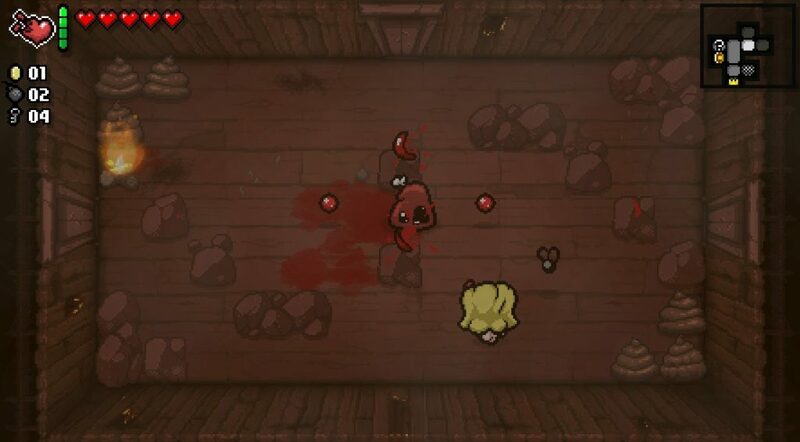 Skinnies leave behind red creep which harms Isaac when he walks on it. Ulcers spit out dart flies until they are destroyed. Clotty shoots 4 blood shots at once while bouncing around. You won’t know what’s in these rooms until you visit them. Once you’ve accessed most rooms, you should come across the Boss door, marked by the skull on the map. 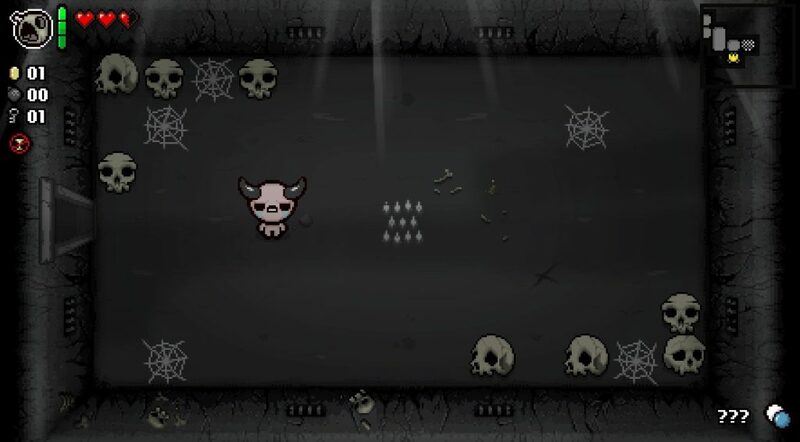 In the basement level, you may encounter Monstro, Larry Jr., Gemini, The Duke of Flies, or Famine as the first boss. 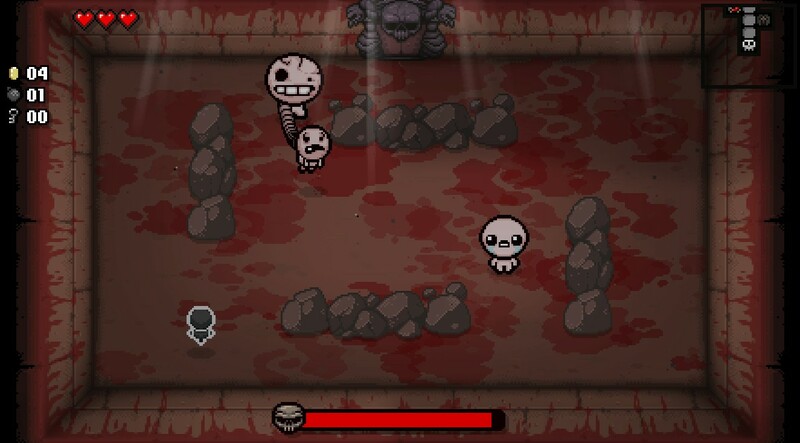 The Afterbirth DLC pack comes with the Turdlings, Little Horn, and Ragman. The bosses appear as nasty abominations from hell. 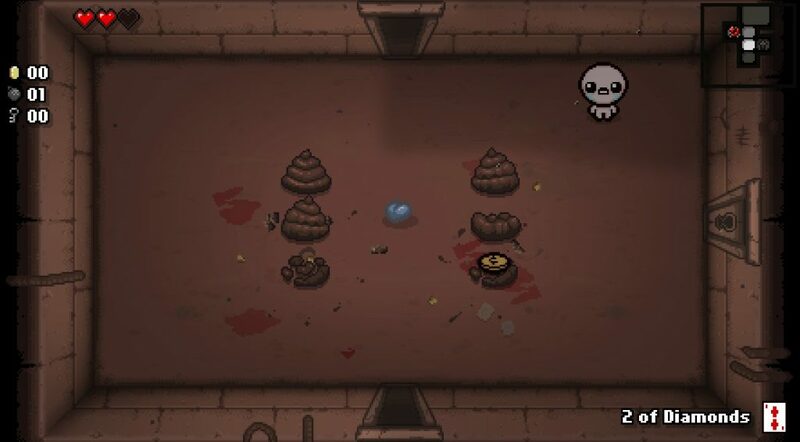 Isaac must defeat them to enter the next floor. Their health bar is visible at the bottom to indicate how much damage Isaac is doing. A completionist run is not worth the trouble because you want to confront a boss at full health to stand a better chance. Their attack patterns are predictable enough but that doesn’t mean they are easy to avoid. Monstro shoots projectiles in large clusters and will try to crush Isaac under its weight. Gemini has two stages, one for each fetus. 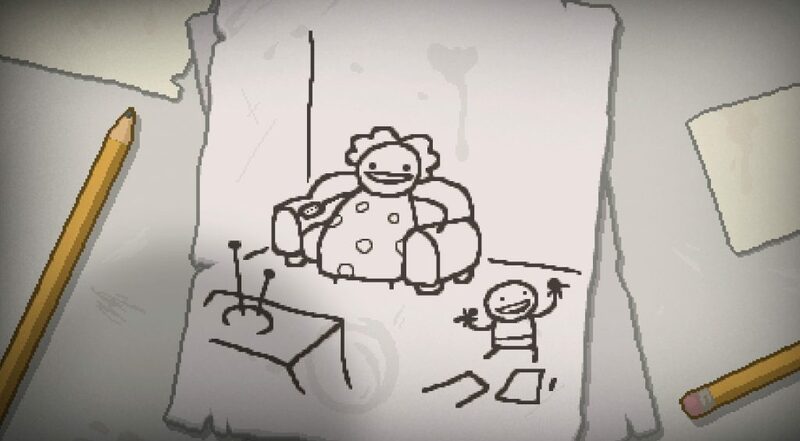 The boss will drop loot like Mom’s Lipstick to increase range or a Bucket of Lard to raise Isaac’s heart count. I’ll explain the different kinds of rooms in The Binding of Isaac. The treasure room has a golden door. It contains valuable power-ups to pick up, one of them being the ability to shoot laser tears. I once got a glass of chocolate milk which produces charged tears. A few are even powered by batteries. The Yum Heart is one that restores health. The arcade is available on the Caves floor. Playing the slot machine could net you a bomb or more hearts. Give the guy at the skull stand a coin to start the cup game. You might win a new upgrade weapon. The third option is to give blood in exchange for coins. This course of action is unwise if you are already low on health. The Binding of Isaac: Rebirth is ultimately a game about hidden secrets. In my opinion, it is rather addicting despite the short play times. 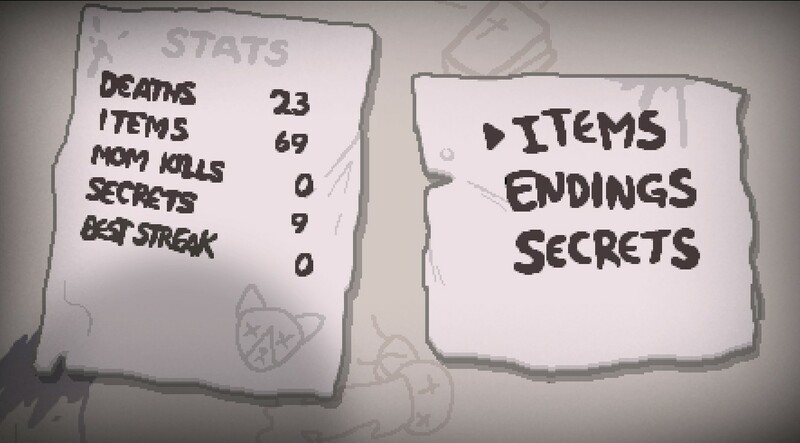 The difficult part is learning how to keep Isaac alive. 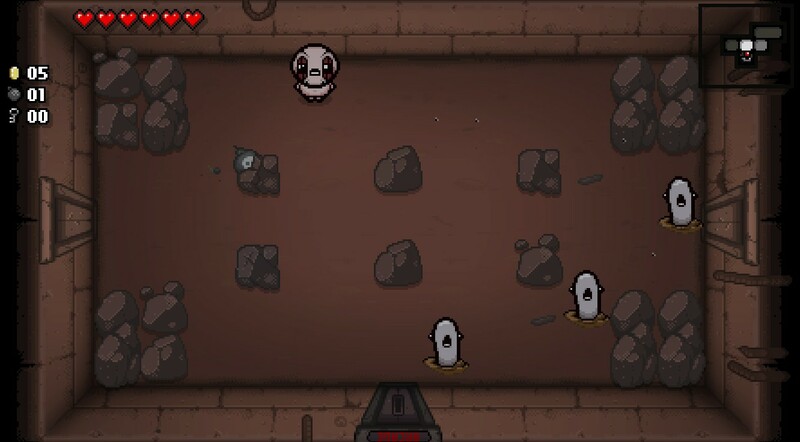 Some rooms force Isaac to lose health since there are spikes on the door. But taking risks does increase your chance of obtaining rare items. The only thing I didn’t like was the lack of save points. You must fight all the way to the end without dying or else you are teleported back to the very beginning of the game. For this reason, I was unable to reach a single ending.